Now that it's getting into summer, the pigs are enjoying the wide variety of roots and grasses they can forage from the bushlands and pastures. Their idea of fun is to dig in the soil all day with their snouts, to be followed up with plenty of lazing and napping in the sun. Pigs are not designed to live in barns, and of all the livestock species in the world, pigs are one of the least suited for confinement. They have a fascination with soil and digging, and to deprive them of that makes for an unhappy pig. As I see it, there are probably dozens of reasons to justify raising pigs outdoors, but I've narrowed it down to the top six, at least as I see them. First, pigs love soil, and soil loves pigs. There is a symbiosis between pigs and microbes that is evident if you look for it. Pigs thrive when they are allowed to run around on healthy soil, and in turn the soil microbes use the pigs to make the ground more lush. Although you need to give the ground a rest from the pigs (they can't be kept on the same piece of ground for too long), it is amazing to see how lush the soil becomes after a pig has been on it for a short time. Pigs can restore the fertility of land. Second, pigs gain valuable nutrients from the soil. The truth is, pigs will eat soil as they root about in it. As to what they find so tasty about mouthfuls of soil, who knows. But they certainly do love it. Third, pigs love to build nests in the ground. They'll use their snouts to make dug-outs, which they pile into for warmth and comfort. They need to build nests, because that's what they're designed to do. It makes them happy. Fourth, pigs forage on roots, grasses, bark, weeds, and dozens of other life forms. Their bodies seem to know what they need, and they'll seek out the plant and insect life they most need to be healthy. The concept that humans can raise pigs indoors and feed them exclusively on fortified grain is a fantasy. We'll never fully know the complexities of a pig's nutritional needs, which is one more reason to let them choose their own diet as much as we can. 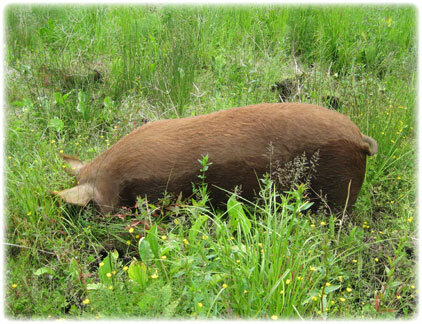 Fifth, pigs benefit from the activity and exercise involved in naturally foraging for food. Active pigs are healthy pigs, and the best way to keep them active is to let them run around the farm digging up the ground. Sixth, pigs need sunshine. They laze in the sun, soaking up rays, saturating their bodies with healthy UV. As a result, their fat becomes a repository for large amounts of vitamins A and D. This is one of the reasons we eat pork --- to obtain much-needed nutrients. It's also why we eat relatively large quantities of lard, so we can enjoy the amazing benefits of healthy fat. 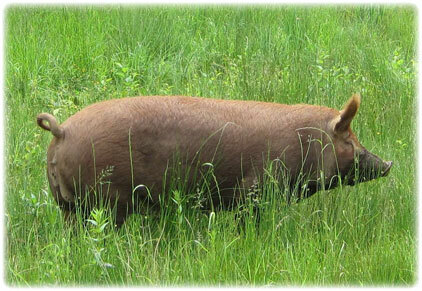 Buy pork from local, organic family farms where the pigs are raised on healthy pastures in the fresh air and sunshine. Outdoor pigs are happier pigs. Plus, the meat not only tastes better, but it's healthier too.